Hailey's Harp & Pub, Metuchen : Burger Mondays at Hailey's Harp & Pub! Hailey's Harp & Pub - Burger Mondays at Hailey's Harp & Pub! Burger Mondays at Hailey's Harp & Pub! Monday Nights are Now Burger nights at Hailey's Harp & Pub! 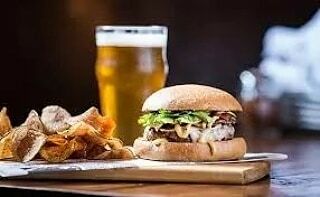 $10 for a speciality Burger and a pint of Miller Lite, Bud Lite or Yuengling! Welcome to Hailey's Harp and Pub, where we strive to provide a fantastically fun place with phenomenal service for you to bring the family to enjoy food, drink and entertainment! Hailey's Harp and Pub's Menu is traditional Irish fare. Chef McMoe leads a hard working crew dedicated to bringing top-tier food to your table at reasonable, family-affordable prices. Our atmosphere is a lively place to bring the kids for a weekly night out to enjoy some of our dishes and to play your favorite games - you just can't get this anywhere else in town! This special cannot be combined with other offers or restaurant.com coupons. This special is available ONLY on Mondays and ONLY in the the PUB.